With smart investment becoming the buzzword in today’s investment world, millennials are frequently inclining toward hybrid investment patterns rather than traditional pure play theories like value or growth. The logic behind this is the effectiveness of a mixed investment strategy as value or growth investing approaches come with their own share of pitfalls. A pure play value investor misses the chance of betting on stocks that have bright long-term prospects. The same way, growth investors often end up investing in expensive stocks. In other words, to make a long-term investment more effective, the principles of both value and growth strategies need to be combined. The quest for a mixed investment strategy led to the introduction of the GARP (growth at a reasonable price) approach. What GARPers look for is whether the stocks are somewhat undervalued and have solid sustainable growth potential (Investopedia). One of the fundamental metrics for finding GARP is the price/earnings growth ratio (PEG). 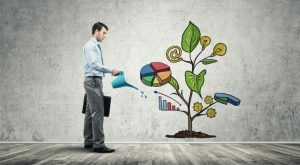 Although it is categorized under value investing, this strategy follows the principles of both growth and value investing. While P/E alone only gives the idea of stocks, which are trading at a discount, PEG while adding the GROWTH element to it, helps to find those stocks that have solid future potential. Say for example, if a stock’s P/E ratio is 10 and expected long-term growth rate is 15%, the company’s PEG will come down to 0.66, a ratio which indicates both undervaluation and future growth potential. Unfortunately, this ratio is often neglected due to investors’ limitation to calculate the future earnings growth rate of a stock. There are some drawbacks to using the PEG ratio though. It doesn’t consider the very common situation of changing growth rates such as the forecast of the first three years at very high growth rate followed by a sustainable but lower growth rate in the long term. Percentage Change F1 Earnings Estimate Revisions (4 Weeks) greater than 5%:Upward estimate revisions add to the optimism, suggesting further bullishness. Value Score of less than or equal to B:Our research shows that stocks with a Style Score of A or B when combined with a Zacks Rank #1, 2 or 3 (Hold) offer the best upside potential. Pfizer Inc. (NYSE:PFE) focuses on the development and commercialization of a wide range of products including human and animal biologic as well as small molecule medicines and vaccines, along with consumer health care products. Apart from a Zacks Rank #2 and a Value Score of B, the company also has an impressive expected five-year growth rate of 7.7%. Leading healthcare diagnostics company Laboratory Corp of America Holdings (NYSE:LH) provides comprehensive clinical laboratory services and end-to-end drug development support. Apart from a discounted PEG and P/E, the stock has a Value Score of B and holds a Zacks Rank #2. Hill-Rom Holdings, Inc. (NYSE:HRC) partners with health care providers by focusing on patient care solutions that improve clinical and economic outcomes in five core areas: Advancing Mobility, Wound Care and Prevention, Clinical Workflow, Surgical Safety and Efficiency and Respiratory Health. The company has an impressive current-year growth rate of 20%. The stock currently has a Value Score of B and a Zacks Rank #2. HCA Healthcare Inc (NYSE:HCA) is the largest non-governmental operator of acute care hospitals in the United States. Headquartered in Nashville, TN, it operates hospitals and related health care entities. It operates in two geographically organized groups – the National and American Groups. Apart from a discounted PEG and P/E, the stock has a Value Score of A and sports a Zacks Rank #1. Terex Corporation (NYSE:TEX) is a global equipment manufacturer catering to construction, infrastructure, and surface mining industries. The company’s manufacturing facilities are located in the United States, Canada, Europe, Australia, Asia and South America. The stock currently sports a Zacks Rank #1 and has a Value Score of A. It also has an impressive long-term historical earnings growth rate of 14.5%. Get the rest of the stocks on the list and start putting this and other ideas to the test. It can all be done with the Research Wizard stock picking and backtesting software. Article printed from InvestorPlace Media, https://investorplace.com/2018/02/5-best-garp-stocks-based-discounted-peg-ggsyn/.